Crush the cookies in a food processor. Pulse the processor until the cookies are fine crumbs. Pour in the melted butter and pulse till combined. Press the crumbs firmly into an oven-safe pie dish. I use a glass/cup to press and compact the crust. Bake the crust for 5 minutes. Remove from oven and cool completely. Pour the coconut milk into a blender and add the melted chocolate. Immediately, blend until completely smooth (about 20-30 seconds). Pour filling into crust and chill for 4 hours or overnight in the fridge. The votes are in. My two young kids announced, "Mom, this is the best dessert you've ever made." With praise like that, I knew I had to share this latest recipe. I rarely make rich chocolate pies like this, but I've been making quite a few this last week. It started as a joke based on a book we read in my bookclub and I kept playing around with a few variations, trying to find what I liked best. Fortunately we've had lots of happy and willing dinner guests available to participate in the taste tests. The variations included a cream-based pie, a pudding-based pie, and the best one of all was one based on light coconut milk. It's similar in idea to the No Moo Mousse I blogged about back in 2008, but with a thicker pie consistency. It contrasted perfectly with the intense, thick crust made of crushed Joe-Joe's. If you're not familiar with the Joe-Joe's cookies, they are Trader Joe's version of classic Oreos. They have all natural flavoring and no hydrogenated oils. They come with a vanilla bean filling or a chocolate filling, and of course you know the holidays are here when Candy Cane Joe Joe's make their limited appearance on the shelves and cause Trader Joe's fans to stampede down the aisles. You know who you are. The crust here is easy - crush the cookies, mix with a bit of melted butter, and press into a pie dish. The easiest and best way to crush the cookies is with a food processor. I use my trusty classic Cuisinart that I've had for over 12 years. When I first got it, I rarely used it (in fact Wona was the first one to use it, not me!). I thought that food processors were a pain to take out, assemble, and clean. But the truth is that they shorten lengthy tasks to just seconds and are a breeze to clean despite their multiple parts. Once you get into the habit of using them, they're a great timesaver. If you're like me and you're slow to take out appliances unless you really need them, believe me that this recipe is worth it and the cleanup is a cinch. The texture of the mousse filling is firm and smooth and silky, and it's only two ingredients! 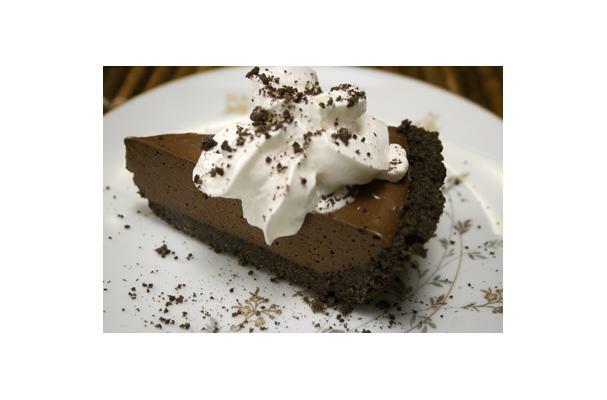 Alternatively you can use Trader Joe's "Instant Chocolate Pudding" mix to fill the pie. The texture and taste is that of eating a thick classic chocolate pudding rather than a silky mousse, but it's an option to try. If you make a pudding filling, use two boxes of the mix and 3 cups of cold whole milk. On the box it suggests 3.5 cups for two boxes, but I think reducing it to 3 cups yields a pie you can cut and serve more easily.